4대강 사업이 생태계를 맹목적으로 파괴하고 더 나아가 민주적 절차를 무시하는 철학적 바탕을 반생태적 사유에서 찾을 수 있다. 생태계의 공존은 기본적으로 공동체의 구성원들이 서로 타자를 인정함으로써 가능한 것이다. 비록 자신의 생존을 위해 타자를 자원으로 이용하지만 근본적으로 생존에 위협이 되는 행태로까지 확대되지 못하는 모자람의 지혜를 바탕으로 무심의 공존을 한다. 이런 자연의 지혜에 대한 이해를 기초로 생태적 사유에 바탕을 둔 삶이 인간 사회의 형평성을 보장하는 공존을 가능하게 할 것이다. 그런데 4대강 사업은 자연을 단순히 도구적 가치로만 여기는 반생태적 사유에 뿌리를 두고 진행되고 있다. 자연의 생태만을 무시하는 것뿐만 아니라 더 나아가 인간 사회 구성원의 타자성을 인정하지 않으며 거의 모든 법을 무시하고 민주적 절차를 따르지 않아 민주 사회의 실현에 반하는 퇴행적 사업이 4대강 사업이다. 더구나 한반도의 4대강은 대양주-동아시아의 생태 축으로서 지구에서 물새들이 생존하는 데 매우 중요한 생태계이다. 이런 생태적 가치를 전혀 고려하지 않는 것은 세계 문화의 구성원으로서 책무를 무시하는 것이다. 4대강 사업을 계기로 생태적 사유에 바탕을 둔 삶에 대한 진지한 논의를 통해 퇴행적 행태가 더는 있을 수 없는 민주 사회의 기틀이 마련되어야 할 것이다. Lee Myung-bak Administration is pushing Four Major Rivers Project ahead without any consideration on ecological aspects. Furthermore the administration has ignored nearly all legal procedures required for such a large scaled project. The project is based on anti-ecological thought, which negates the others in a system and is totally ego-centric. Anti-ecological thought seeks value from the others in terms of utilization for self. Although every biological member of an ecosystem uses the others as resources for its own survival, it never denies the others` existence. A species except for human species never thoroughly exploits natural entities because of its physical limitation of ability. The limitation gives biological entities of an ecosystem frugal wisdom of unintentional coexistence of all entities in the ecosystem. If we pursue the living based on ecological thought of such wisdom of nature for coexistence, then the human society with fairness will be ensured. The Four Major Rivers Project, however, has been driven by the administration rooted on the anti-ecological thought that considers nature simply tools for human existence. This kind of attitude does not simply deny ecological entities of nature but also negates otherness in a human society. In addition, for self, it ignores almost all legal requirements and has brought in the socio-culturally retrogressive behavior that disregard all the legal procedures required. The result of such retrogressive behavior is the Four Major Rivers Project, and is going to hinder a democratic society from being built. Korean Peninsula, especially the four major rivers, is so significant in reserving migratory waterbirds of the earth as an ecological axis of the east asian-australasian flyway. Ignorance of such ecological values of the rivers negates obligation as a member of the global culture community. 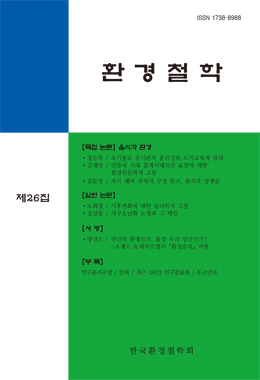 The project has disclosed such anti-ecological attitude hidden deep in the Korean society, and will be a key to make democratic society more concrete if we nip the retrogressive project off in the bud and materialize ecological thought in our society.